The Faculty of Law of the University of Tetova, on January 24, 2019, in cooperation with the Institute for Political and International Studies and the Center of Freedom and Human Rights, organized a roundtable discussion on the Euro-integration aspects of the Western Balkans. Dean of the Faculty of Law, Prof. Dr. Qebir Avziu, said that the integration of the Western Balkans into the European Union, especially Macedonia, would be a great relief for the citizens because they could move freely in all European countries. He said that the Republic of Macedonia in recent years is making continuous efforts in order to meet all the conditions and criteria required by the European Union to become part of as soon as possible. According to him, with the accession of Macedonia and the Western Balkan countries, a new perspective for the region would be opened. He also estimated that the Republic of Macedonia, by ratifying the Prespa Agreement in the parliament, is very close to membership in the Euro – Atlantic structures and the EU, hoping that the Greek Parliament in the following days will ratify this agreement on changing the constitutional name of Macedonia, which for decades has been a barrier to Macedonia’s membership into NATO and the EU. 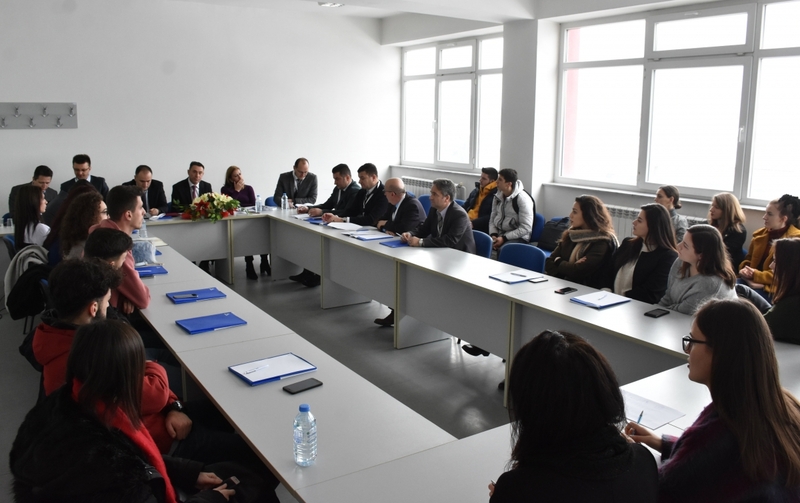 This table was attended by professors from the Faculty of Law and professors from the University of Oradea of Romania, such as Prof. Mircea Brie, Prof. Cristina Matiuta and Prof. Polgar Istran. The latter, during their speeches, focused on the experiences of their country, the Republic of Romania, before and after its membership into the European Union. They said that at a time when Romania was not part of the European Union, the country has been isolated and that many processes have slowed down – be it educational, economic, social, cultural, political, and so on. But, according to them, with Romania’s membership in EU their country has had great benefits in all spheres. They also said that the Republic of Macedonia, if within a very short time, becomes a member of the EU, will experience these benefits of the European Union and that the inhabitants will find it easier to secure the future in this country. After the completion of this roundtable, the participants were awarded certificates by the Dean of the Faculty of Law, Prof. Dr. Qebir Avziu.